Ryouta Sakamoto has suddenly gone from playing his favourite online game to becoming a real life player in it. 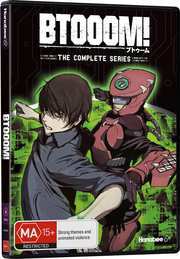 Left on a mysterious island with a set of provisions, a bag of bombs and a strange crystal embedded into his left hand - this is the world of BTOOOM realized. Beautifully replicated, this game of BTOOOM is an all out dog eat dog world, where to escape you will need to kill seven others before they kill you. But there's a difference between a game and reality. When a death is absolute and there are no second chances, Ryouta is about to learn the true value of a life.